What Batteries Are Used in Stair Lifts? If you are thinking about investing in a stair lift for your home, you may be wondering about the power supply for the stair lift. Most stair lifts are powered by batteries. For example, the Indy Curve Stair Lift is designed to fit to the exact specifications of an individual home staircase. It is also designed to reach around every corner of a staircase. So what powers a stair lift that offers such versatility? Two 12-volt batteries. It’s that easy and that simple. Speaking of simple, the batteries are used along with a charger and a common household plug. Think these batteries are super expensive and only work for a short amount of time? Think again. Stair lift batteries typically last about two to three years. Each battery costs about 50 dollars (prices may vary). So don’t shortchange yourself or someone you love from receiving the benefits provided by a stair lift. We know how important mobility is in a person’s life. Mobility equals independence. If that mobility is compromised, a person can suffer from a loss of confidence. Stair lifts can re-establish some of that mobility and independence. The fear of having to leave a beloved and comfortable can be dismissed like some bad dream. 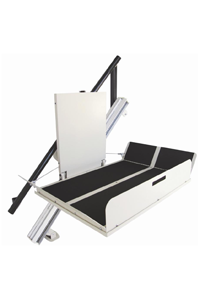 The stair lifts offered by Indy Stair Lifts can work with all types of homes. There are stair lifts designed to work indoors and outdoors, expanding the options for individual mobility and independence. There are ways to maintain the lifestyle you want, batteries included.